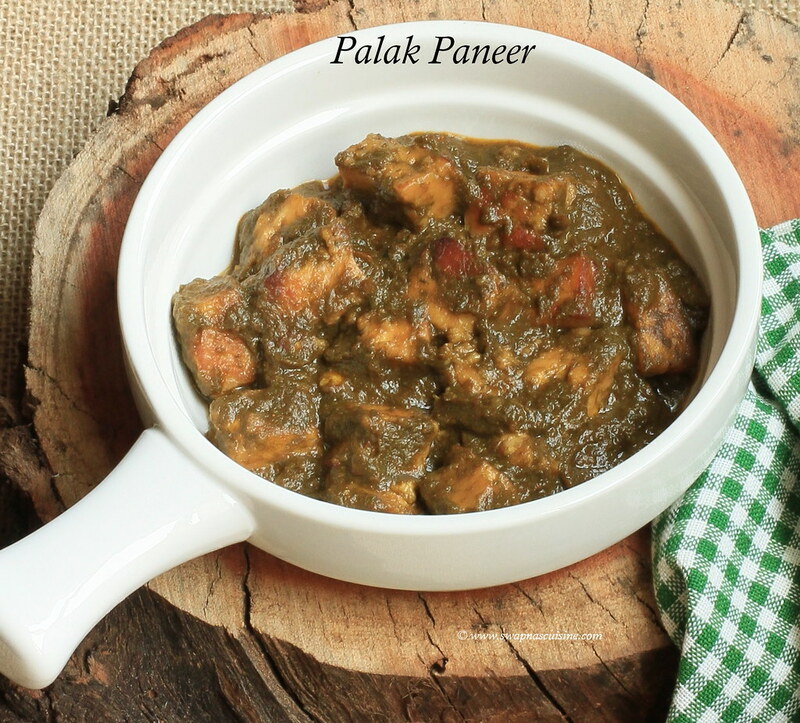 Palak Paneer is a popular paneer dish served in road side dhabas and in restaurants. 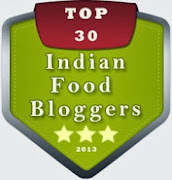 Lightly fried paneer is cooked in a pureed spinach-tomato gravy. Goes well with boiled rice, chapathi or Nan. Wash and chop palak. Cook with 1/2 cup water for 10 minutes on low flame after the first boil. Cool and grind to a smooth paste. Grind onions, garlic and ginger together. Heat 1 tbsp ghee in a non-stick pan and slightly fry cubed paneer. Drain and keep aside. Heat rest of ghee in the same pan. Add onion paste and cook till onions turns golden and ghee separates. 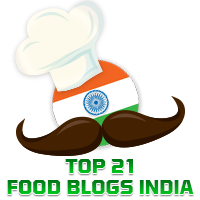 Add chopped tomatoes and green chillies. Cook for 5-6 minutes on slow fire, till ghee separates. Add ground palak, add a little water if too thick. 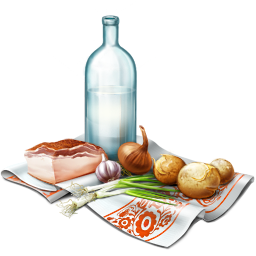 Cook for 6-8 minutes on slow fire. Add salt. Add cardamom powder and fried paneer. Mix well and remove from fire. At the time of serving, heat 1 tbsp ghee,add 1 tsp red chilly powder. Remove from fire and pour this over the heated palak paneer. 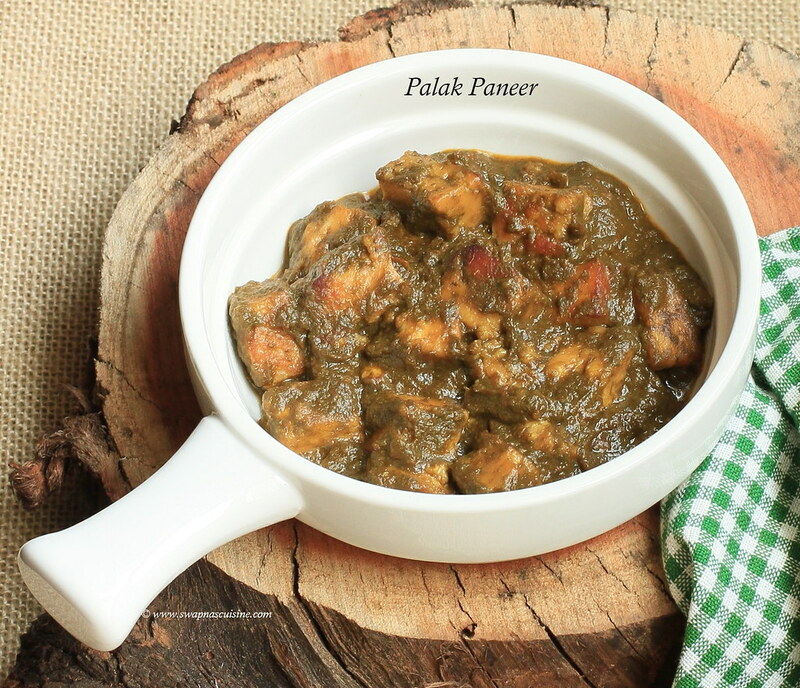 Thanks for sharing lovely food recipe specially palak paneer..